How do I add colour to a greyscale JPEG in Publisher? In InDesign, you can do it really easily by using the Direct Selection Tool and then choosing a colour. I cannot see any way of doing the same thing within Publisher. For the screenshot, the red set of ornaments were coloured in Illustrator so you could see what I want to do. How do I add colour to a greyscale JPEG in Publisher? look at 'File > Document Setup > Colour > Colour Format'. Make sure that RGB, CMYK or LAB is selected according to what you need. Then you should be able to use colours in your document. @dominik Thanks for the reply but that isn't what I am asking. All my documents are set up to be CMYK. I want to know how to apply a colour to a greyscale JPEG on an object by object basis. 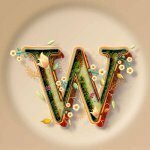 @Wosven has pointed to a couple of answers, already. I hope that helps. @Wosven I saw that before posting but you have to use Photo to do it. I want to know how to do this solely in Publisher - just like you can in InDesign. I have tried to use that method and can't get it to work for me. 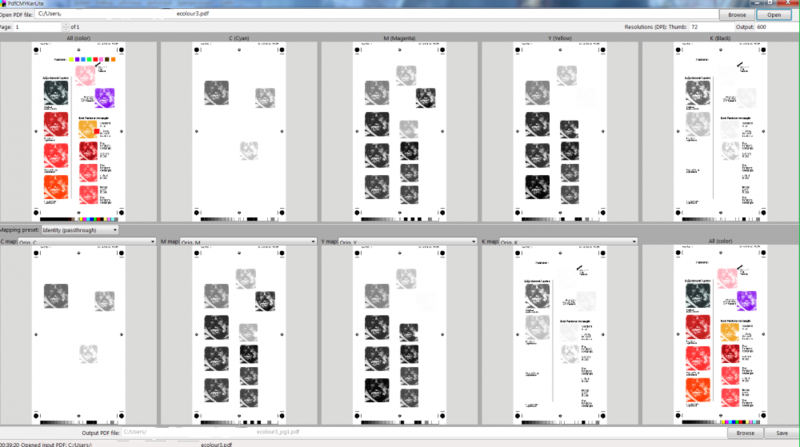 It seems a very long-winded way of doing something which is so easily done in InDesign. Place your Greyscale JPG or TIFF into the Publisher document. Select the placed image in your layers panel. Apply a Gradient Map effect from the Layer Adjustment button at the bottom of the Layers panel. Edit the gradient within the dialogue box for the Gradient Map so that it has two stops: color in place of black, and white for white. Apparently applying a color directly to the image itself just fills the image frame with a solid color. PS. Channel mixer result is orange because I wanted it orange, and we can achieve interesting results with it, since it can be used on full color images. Thanks, that works for me. It's still a lot more work than InDesign but at least I can do what I want without having to resort to using another application. Note that if you also own Photo and/or Designer, you'll be able to use them inside of Publisher using the Photo and Designer Personas, but only after the 1.7 retail versions of Photo and Designer are released. @walt.farrell I own both applications. I’m thinking that it may be far easier to do this when the Photo and Designer personas are available. It still won’t be as easy as it should be though. I do wonder if I will end up with multiple colour versions of the same file though. Saving as a greyscake JPEG and colouring within InDesign stops such a scenario. For the screenshot, the red set of ornaments were coloured in Illustrator so you could see what I want to do. 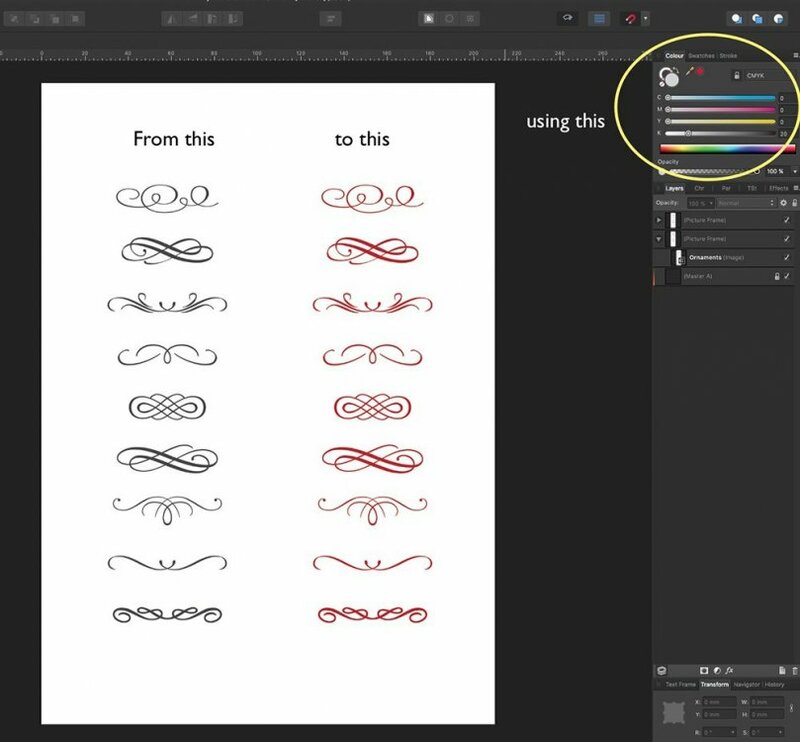 Well, if you have these ornaments in Illustrator just copy and paste the graphic you choose to Publisher. It will paste to Publisher as an editable paths, and you can then change the colour to whatever you want in Publisher. EDIT: I realise now that your question was about jpeg but there is no reason to copy stuff from Illustrator to Publisher as jpeg if the graphic is an editable path. What we are missing without the original feature, is to colour easily bitmap B&W and greyscale images in (a) Pantone spot colour. Unless we use vector, those above will be CMYK. Those are created in Illustrator but I also use JPEGs hence my original question. I will try the copy and paste method to see how it works. Yep they will be CMYK, which is ok for the majority of my work but sometimes I need the ability to use Pantone spot colours which is another reason why I asked the question. I haven't tested this, but, if one applies a Pantone color to one of the stops in the Gradient Map adjustment layer applied to a greyscale image, does the art get separated out onto a single Pantone color plate, or does Publisher separate the image onto the four process color plates? 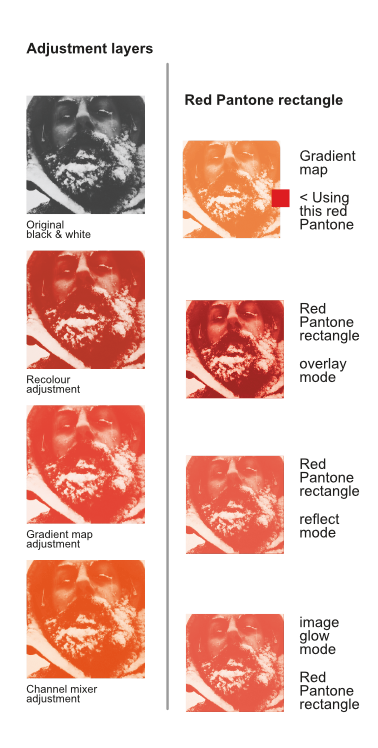 Pantone spot colors do not display accurately in a CMYK Publisher document. Appearance seems to be fine in either CIE Lab space or in RGB spaces. Working with the Swatches Panel is a very tedious and fiddly experience. The number of clicks required to add a spot color to one's document palette should be reduced. Although I applied Pantone 173 to my Greyscale image, Pantone 021 got added to my document palette. Spot colors added to the document palette are identified generically as "Global Colour x" rather than by their proper name. When one highlights the generically named spot color in the swatches palette and then selects the Pantone swatch book from which the color came, the color chip is not highlighted or identified in any way among the thousands of other Pantone color chips. The only indication of the spot colors actual name comes if/when one switches to the Colour Panel. There doesn't appear to be a Channels Panel or a Separation Preview Panel that would enable one to check color separations prior to exporting to a press-ready PDF. And FINALLY, I exported my test document (wherein I applied a spot color to a Gradient Map to recolor a greyscale image) as a press-ready PDF, opened the PDF in Adobe Acrobat, used Acrobat's tools to inspect the color separations and found that an empty frame filled with Pantone 021 separated onto a spot color plate for Pantone 021, but the spot color applied to the greyscale image using the Gradient Map adjustment got separated into the four process color plates, CMYK. These issues needs immediate attention. I think I'll repost this as a separate discussion thread item. Publisher separate the image onto the four process color plates? Yes, when you use them in a gradient map or in a form with a mask. Bellow show only the CMYK plates, the Pantone's ones don't (the little squares in the 1st full preview are Pantones). The 8 B&W pages are the CMYK plates, and the last one show C+M+Y+K (without the Pantone's plates). Only the squares are missing, all the other tests are converted to CMYK.